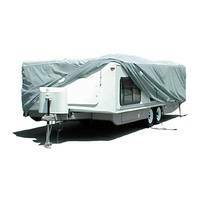 ADCO Hi-Lo trailer RV covers are made to accommodate the taller and wider pop-up campers. These covers are available in 2 different sizes depending on the measured length of your RV, of course, not including the tongue. Once you've determined which size cover would work best for your RV, place your order and start protecting your camper with a high-quality cover.